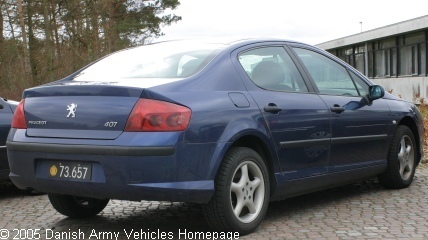 Danish Army Specific: Bought in 2004 the Peugeot 407 supersedes the 406 model. Historical: The 407 was shown to the public at the the Geneva Motor Show in february 2004, and introduced on the European marked in May same year. Some 5 month later the the 407 SW became available. The SW body shape is mainly distinguished from the saloon version by its panoramic glass sunroof, and its two part rear tailgate opening. The 407 SW, like the saloon is produced at the Rennes factory at a rate of more than 1,000 units per day. A coupé will be unveiled in Geneva in spring 2005, and probably go on sale in early 2006. Length: 4.68 m (182 inches). Width: 1.81 m (70 inches). Height: 1.45 m (56 inches). Weight: 2.075 kg (4.565 lb.). Engine: Own 4-cylinder, type RHR, 1.997 cm3 (122 cubic inches) displacement, turbo, intercooler, liquid cooled. Horsepower: 137 at 4.000 rpm. Tyres: 215/55 - R17 (alt. 205/60 - R16). Fuel capacity: 66 liter (14 gallons). Range: 550 km (344 miles). Additional: The 407 has servo assisted steering, ABS-brakes and double airbags. The engine complies with the EURO IV standard.